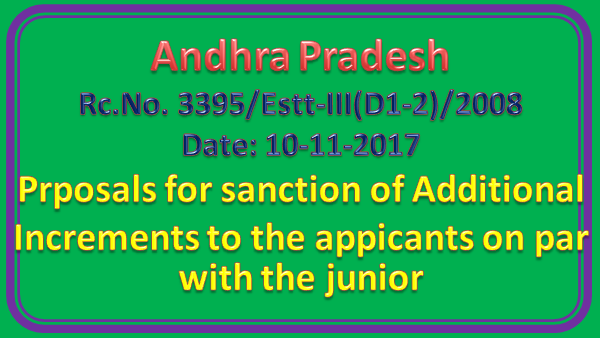 Sub:- School Education Department -Prposals for sanction of Additional Increments to the appicants on par with the junior - Certain informaiion called for - Reminder - Reg. 4.This Office Procs.Rc.No.3395/Estt-III/2008 Dt. 10-11-2016. 5. This Office Procs.Rc,No: 3395/Estt.III/2008, Dt: 08.12.2016. Attention of the District Educational Officer, Srikakulam/ Visakhapatnam/ West Godavari/ Krishna/Guntur/ SPSR Nellore is invited to the refererces 6th read above, wherein the District Educational Officer, Srikakulam/ Visakhapatnam/West Godavari/ Krishna/Guntur/ SPSR Nellore are requested to furnish the information in the prescribed proforma along with Service registers of the Applicants for internal audit and ensure whether the claims of the individuals in OAs are genuine or not regarding juniors drawing more than seniors it, these cases implementing the orders of the Hon’ble APAT. In view of the above, the District Educational Officer, Srikakulam/ Visakhapatnam/ West Godavari/ Krishna/Guntur/ SPSR Nellore are requested to furnish the information in the prescribed proforma by 13.11.2017 to take further action in the matter. Delay in dealing with court cases liable for imitate initiated stringent action against the defaulter.